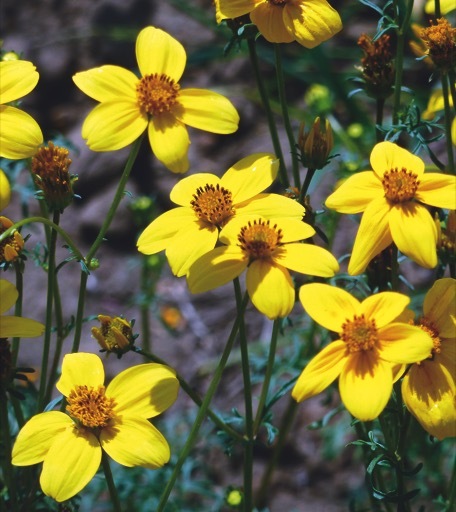 The bidens aurea is a perennial large family Asteraceae. Although native to Central America (including Mexico), it is quite hardy and robust. This plant, which grows visibly to reach 1.50 m to 1.80 m. It quickly forms a dense clump composed countless rigid but graceful stems. These rods are narrow leaves, toothed, dark green. But this plant is especially appreciated for its abundant blooms resembling a swarm of butterflies. It blooms from mid-July to November and offer a profusion of flowers of a bright yellow, about 3 cm in diameter.